I'm not a big fan of coffee table books - and this is certainly big and heavy enough to make a coffee table from if you attached legs (I certainly wouldn't fancy reading it in bed) - but Ashley Cooper's 495 photographs covering the impact of climate change, fossil fuel energy generation and renewables are absolutely stunning - crisp, large scale, extremely colourful and putting across a message that is sometimes hard to convey in words. Whether Cooper is showing oil refineries and damaged landscapes or homes battered by storms and decaying after drought, these are dramatic images. 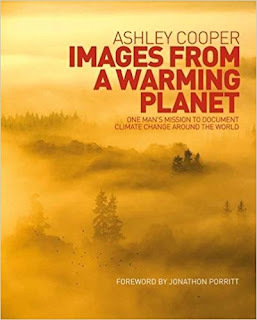 In his foreword, Jonathon Porritt says 'do not allow the power of the images come between you and the people' - emphasising that it's not enough to record what's happening, but rather we should this kind of thing as a call to arms. My only concern here is that there's an awful lot of 'isn't this terrible' scenes and some nice images of the small scale 'good stuff' - but not enough suggestive of how we get from here to there. For example, there's a section on renewables which has a number of visually striking wind farms, but not much in the way of the more important solar farms - and no mention of the huge need to develop better storage (which often feels a bit too hard-tech to be truly green) because most renewables are not consistent in their output. From a scientific viewpoint, I would have liked to have seen more restraint in the assumptions of causality. We are presented with the impact of storms, for example, as if they are definitively the result of climate change. Scientists would always temper the assertion, because there have always been devastating storms. We can say with a high probability that storms are more frequent as a result of climate change, but we can't say that a particular storm was caused by it. There's also an amusing little scientific contradiction on a page that comments about Iceland getting 30% of its energy from geothermal and also carries a picture of the Sun saying 'Ultimately all the Earth's energy comes from the Sun' - it certainly mostly does, but there are exceptions, notably nuclear (which only gets a passing dismissal later on) and geothermal. So there may be rather too much of an 'isn't this terrible' message accompanied by over-simplistic solutions - but this shouldn't get in the way of these stunning images and the job I hope they can do in persuading some of the undecided on climate change. If the pictures get the message that we need to do something across to their viewership (somehow, readership doesn't work) and they then look elsewhere for those solutions, then at least the images are doing their job. And despite Mr Porritt's concerns, I don't think we should underplay the power of the photography. It's a great book visually and I'm delighted to have had a chance to get a good look at it.